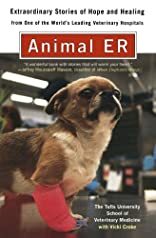 Written in collaboration with the Tufts University School of Veterinary Medicine by a Boston Globe reporter and author who was granted rare access to their emergency ward, Animal ER takes us into the day-to-day drama of life on the front lines of veterinary medicine. In this premier animal facility, experts in the fields of surgery, internal medicine, cardiology, ophthalmology, and oncology provide care for patients of all shapes, sizes, and breeds. Here, operations using state-of-the-art technology go hand in hand with personal counseling for owners and pets in crisis. From a pygmy hedgehog with mites to an elephant with an eye problem to the Dalmatian who must undergo disc surgery for his back...from the close calls to the split-second decisions that can save a life, Animal ER is a moving testament to the healing powers of love and medicine-and to the timeless bond between people and their pets. About Vicki Croke (Author, Editor) : Vicki Croke is a published author and an editor. Some of the published credits of Vicki Croke include Animal E.R..